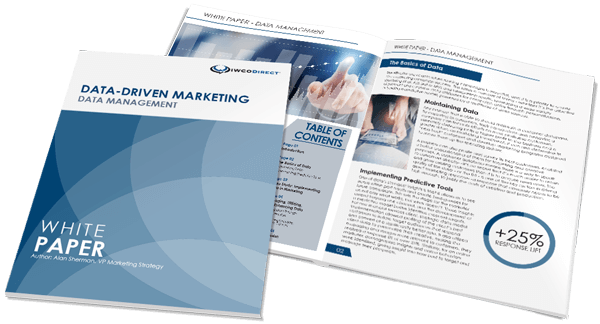 Many of today’s marketing campaigns rely on an integrated approach that blends print and digital communication. Yet consumers don’t differentiate between a brand’s online presence and offline presence. They expect a consistent experience across channels, whether it relates to messaging, visuals or offers. And now more than ever, consumers are turned off by communications from brands if they aren’t directly relevant and timely to their needs. An impersonal, disjointed marketing communications plan just won’t work anymore (not that it ever really did). As marketers, it’s our job to deliver a consistent consumer experience. In order to do so, collaboration between departments and utilizing the right technologies is essential. When marketing organizations are siloed by channel it becomes difficult, but still critical, to ensure a positive brand experience is maintained. Recent advances in printing, such as improvements in the speed and cost of digital printing, have allowed us to tailor direct mail messaging, making it exponentially more relevant to consumers. Back-end automation tools allow more timely implementation of trigger campaigns, that send marketing mail based on consumer behaviors as they happen. And as we’re able to better understand the habits and preferences of consumers online based on their digital footprint, we can ensure consistency down to the individual level. When it comes to using multiple channels to communicate with customers or prospects, marketers should ensure both offline and online communication provides a unified experience. Ideally, the same day someone receives a direct mail offer, they also see banner ads with the same look and feel. When they enter a search term for that product, the provider is at or near the top of search results. And when they login to their preferred social media platform, there is an update about the offer. Our goal is to make this possible for our clients with tools like QR codes, PURLs and Augmented Reality (AR). This way, the direct mail recipient can easily move to an online experience, customized for them, that flows seamlessly from the design and offer he or she received in the mail. The next step in this evolution will be to better define how these channels can be integrated to maximize the return on marketing investment. What is the impact of mail on the digital channel? What is the impact of digital on direct mail response? What is the impact of DRTV on both of these channels? Once can answer these questions, we can then work to optimize impact. It’s important to work with partners that understand the entirety of your brand and your goals. Each of our client markets is different, but we have developed compelling best practices for building test plans that transcend specific markets. Great partners will craft a channel agnostic strategy that is best suited to achieve your goals, rather than try to force a specific channel or approach just because it’s the one they are most comfortable with. While direct mail is the foundation of our service offering at IWCO Direct, we have a growing number of experts in-house who can help our clients leverage digital and social strategies in conjunction with direct mail to maximize results. More than ever, we are encouraging clients to think more broadly about the customer experience, and how they can successfully use direct mail with complementary channels. Through our Proprietary Intelligence model, we are equipped to help implement those strategies every step of the way.